My friends and I have been talking about having a Soup Swap similar to a Cookie Swap. We don’t have the details ironed out for it so if anyone has participated in a Soup Swap, let me know. We welcome your input. Talking about the Soup Swap and Cookie Swaps put me in the mind to make some cookies tonight. 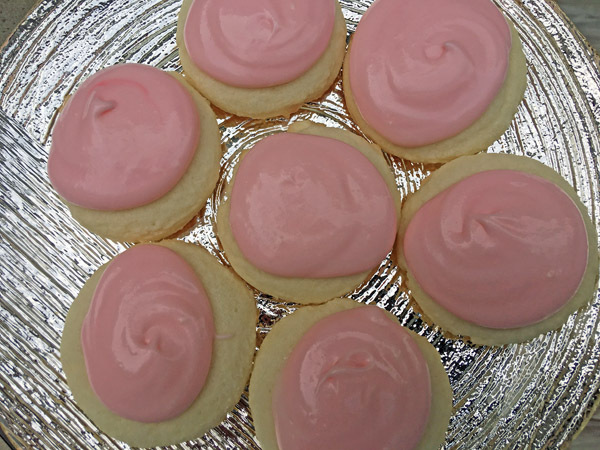 My favorite cookie is sugar cookies, but I wanted to attempt to control myself so I made these Dainty Sugar Cookies. I’m not sure I feel better about eating 10 Dainty Sugar Cookies in comparison to one whopper-sized cookie but I’ll let you know how guilty I feel after the taste test. Aren’t All Cookies Sugar Cookies? A wise person once said, “All cookies are sugar cookies. A cookie without sugar is just a cracker. ” Gary Gulman. You have a point, Gary, however I do love a traditional sugar cookie as compared to a cookie with sugar and other goodies added in such as oatmeal, chocolate chips, or nuts. Pure and simple is best. 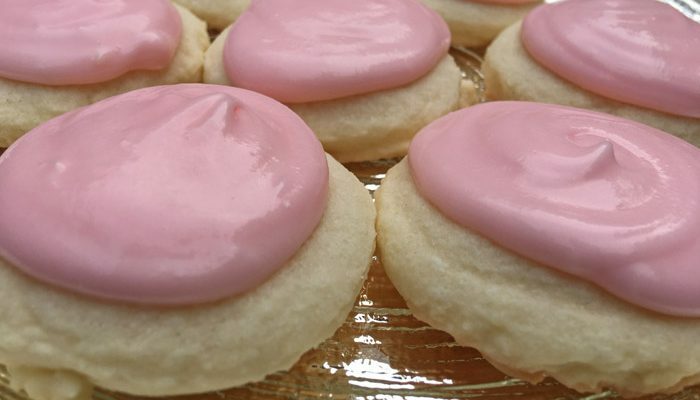 Dainty Sugar Cookies are a cross between a shortbread and a crispy sugar cookie. With the addition of the powdered sugar and the extra oil, you get a shortbread texture, however the added baking soda makes them a bit fluffier than shortbread. This is a very interesting and good recipe. 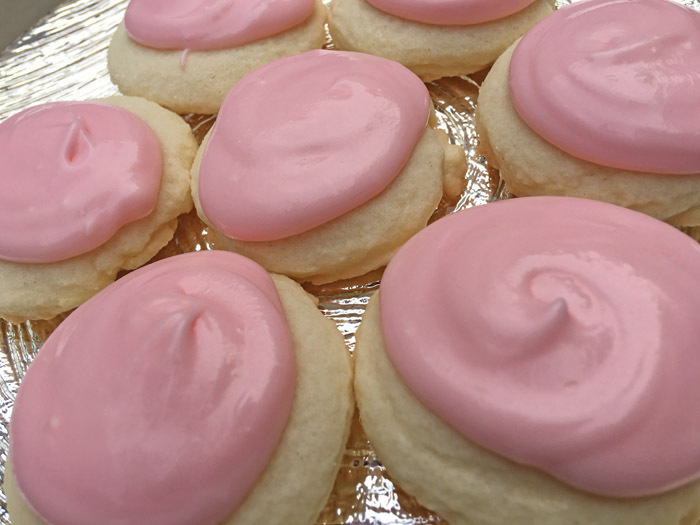 According to my Trixie Belden-like detective skills, sugar cookies originated in the United States through German settlers in Pennsylvania in the mid 1700’s. Europeans called sugar cookies gimblettes, plunkets, or cimbellines. These first cookies were hard and dry and travelled well in a saddle bag. No thanks. I prefer my gimblettes moist and tender with the hint of a crisp, and of course dolloped with frosting. Cream together the butter, oil, sugars, water and egg; set aside. In a separate bowl, combine flour, baking soda, cream of tartar, and salt. Add the flour mixture to the butter mixture until blended. Refrigerate 30 minutes. Scoop by tablespoonful onto parchment paper on a baking sheet. Flatten cookie ball with the bottom of a glass dipped in sugar. Bake 8-10 minutes at 350 degrees. Allow to cool. Frost and eat! I froze the rest and have been enjoying them in my lunches.